The echo of a bull bugling is unlike anything on this great earth and elk hunting is something that captures the minds of thousands each fall. However, jumping into the sport is quite often the biggest hurdle for many. The best way to get started is to get out there and scout. I was in the same boat about five years ago and through lots of trial and error have developed a process of scouting that has given me great success in my short time spent hunting the great elk. The following are a series of steps that will help make your summer scouting a success. Here in the West there are a lot of mountains and lots of elk. The number of areas elk call home are quite vast and honing in on some specific areas will be advantageous. Picking locations will depend on a lot of things some of which include word of mouth, articles or videos you’ve watched, forums, or just a gut feeling. If you don't have many resources when starting, you can simply find OTC units that have quality habitat that include remote areas with no trails or roads. To start, begin by using Google Earth and start scouting for areas you feel will hold elk. Google Earth gives you many tools. First, you can move the angle of the camera around so you can see the contour of the landscape. This lets you see benches, ridgelines, and basins in a way that let’s you assess the terrain much easier than a direct overhead. Programs such as ONXMAPS allow you to look at this information, as well as, show you public/private landownership and Game Management Unit Boundaries. You can also use online mapping programs such as AcmeMapper or CalTopo. These give you topographical views and the names to more creeks and trails. In each location, look at the quality of habitat. Every elk needs 3 essentials to survive. These are water, feed, and cover to bed in. The more areas that hold these essentials the better your chance of finding elk. Once you've found an area with good habitat, look at where hunters can access it from. In most cases, areas 2-7 miles from the road hunt the best. Many hunters won’t hike more than 3 miles and guys on horseback generally go at least 10-20 miles in before setting up camp. Now that you've spent a few evenings looking over maps it’s time to pick your best 2-4 spots and get ready to put your feet on the ground. A good pair of boots. Break them in prior to your first day scouting. I like the Danner Gila or Gavre as they are light but still provide good ankle support. Overall you want to keep your pack light so you can cover country easily, but bring enough to survive if something were to happen while out there. As a great rule of thumb, let someone know where you are headed prior to leaving. A day of scouting should be treated very similarly to a day of hunting. This is your chance to cut down on your learning curve so that when hunting season finally rolls around, you’ll be ahead of the game. Show up early. If the country is fairly open you’ll want to be in a good location to glass as the sun is coming up. If you are in heavy timber this isn’t as much of a priority but an early start is still key. As the day progresses, try to cover as much country as you can. Be on the lookout for game trails, rubs, wallows, elk beds, and general elk sign (tracks and poop). Be thinking about how elk move through these areas and keep tabs on the prevailing wind while you are there. Make notes on a map or your GPS and review them when you get home. A. Batteries & Card - Make sure it has fresh batteries and SD card. Sounds simple enough but often the little things can be overlooked. B. Know your Settings - Ideally set up the camera in your house for a day. Make sure it’s performing the way you want and that you are aware of what your camera is capable of. C. Location – Finding a suitable location for your camera will be the most important part. Water or heavily used trails are the best locations. Water allows you to get multiple photos of an animal and is an area known to attract game. Trails are a bit tougher as the animal is moving. I like to position the camera to catch the animal moving straight towards the camera so that I have the best chance at getting a good photo. Once you’ve found a spot to hang your camera, look for a solid tree. Avoid dead trees or trees that are liable to move a lot in the wind. D. Make sure it’s ON – Remember to turn your camera on, duh. E. Lock It – Animals are curious especially bears. So are humans and their hands are often much stickier. A lock is a simple theft deterent. Far from perfect but it makes it tougher for someone to walk off with your cam. My preferred choice is a Lock Box. All major camera manufacturers make them and this keeps your camera safe and secure. 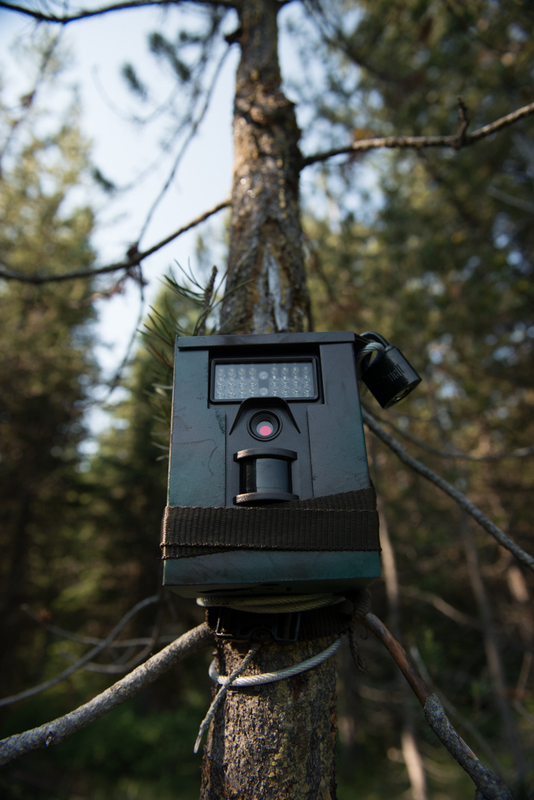 Bears are known to chew up cameras and this will make sure your investment lasts more than one season. F. Check It – Be sure to return and check your camera. Set it at the start of July and check sometime right before August. This allows you to move its location if you're not getting the photos you desire. If your camera only shows cow elk don’t be discouraged. The bulls move drastically during the rut and someone will show up to take advantage of a large number of cows hanging out in one location. G. Know the Laws – Know the laws regarding game cameras in your state. Some allow use year-round and others only when no big game season is open. If you are in open country stay until dark. The last three hours of light are your best chance at seeing a velvet bull come out and feed. This is your chance to let the glass do the walking for you. Now that you’ve put your boots in the dirt hopefully you have a better idea of what areas hold elk, how they are moving, where the water, feed and cover is, and what the prevailing wind generally does throughout the day. My final piece of advice is to go back and study your maps after you’re done scouting. Most days you can’t get to every spot and you may see something you’ll want to investigate further at home. Good luck out there and most importantly enjoy your time outdoors with friends and family! ZACK BOUGHTON hails from Missoula, MT where he fly fishes and hunts year round. His passion of filmmaking and photography led him to co-found Montana Wild with his brother, Travis. His goal is to inspire others through images of the great outdoors.